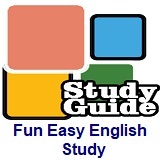 ﻿ Fun Easy English - new american english study introduction. This is a new section of Fun Easy English as of February 2019. This study section focuses on ways to improve your methods of studying English and specific topics not covered in other sections of Fun Easy English. Lessons will be added throughout this month. Please return often for updates. Thanks for visiting this site. §² Do You Know What an Indirect Question Is? §² Can You Catch These Native Speaker Mistakes? §²¹ Are You How You Talk?